Born on January 1, 1965 in Selma, Alabama, Terri Sewell earned a bachelor’s degree from Princeton University in 1986. During Sewell’s freshman year there, Michelle Robinson—later to become First Lady Michelle Obama—served as her “Big Sister” in a university program that matched minority freshmen with upper-classmen mentors. After graduating from Princeton, Sewell went on to earn an MA from Oxford University in 1988 and a JD from Harvard Law School in 1992. Upon completing her formal education, Sewell served as a judicial law clerk to Chief Judge U.W. Clemon in the U.S. District Court for the Northern District of Alabama. In 1994 she was hired as a securities attorney by the New York law firm of Davis, Polk & Wardwell, where she worked for more than a decade before becoming a partner in the Birmingham law office of Maynard, Cooper & Gale, P.C. 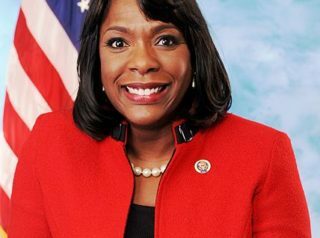 In 2010 Sewell was elected, as a Democrat, to represent Alabama’s 7th Congressional District in the U.S. House of Representatives, where she continues to serve as a member of the Congressional Black Caucus. Sewell has long opposed what she characterizes as “discriminatory” Voter ID laws that she claims are intended to prevent nonwhites from casting ballots in federal elections. “It’s about [voter] suppression, not protection,” she avers. Sewell was unfazed by a high-profile 2013 New York Times investigative report on the massive fraud permeating the so-called Pigford] case where, on the basis of a 1997 federal lawsuit, tens of thousands of self-identified “minority farmers” had collected billions of dollars by alleging, falsely, that their past efforts to secure farming loans from the Department of Agriculture had been denied for racist reasons. In a panel discussion moderated by MSNBC host Melissa Harris-Perry, Sewell described the Times piece as a “gross mischaracterization” of the facts, though she failed to provide even a single example of where the article was mistaken. The consensus on the panel was that any criticisms of the Pigford handouts were rooted in racism. Also in 2013, Sewell and three fellow House Democrats—Dina Titus, Marcia Fudge, and Zoe Lofgren—proposed legislation to create “feeding programs” that would expand the availability of taxpayer-funded school lunches to weekends and holidays throughout the academic calendar. an ever-increasing reliance on “green energy” sources such as wind and solar, along with a phasing out of fossil fuels, the imposition of carbon taxes, and the raising of vehicle CAFE standards, should be put in place. For additional information on Sewell’s voting record on a range of key issues during her years as a legislator, click here. For additional information on Terri Sewell, click here. Further Reading: “Terri Sewell” (Votesmart.org, Keywiki.org); “Terri Sewell Applauds Supreme Court Ruling Against Voter ID Laws” (6-17-2013); “US Rep. Terri Sewell Opposes Alabama Photo Voter ID Law” (Alabama Media, 9-23-2011); “Dems Ignore Rice’s Record of Failure, Deem Her ‘American Treasure’” (Breitbart.com, 11-15-2012); “Obama Allies Begin Pigford Pushback” (by Lee Stranahan, 5-6-2013); “Dems Seek to Expand School Lunch Program to Weekends, Holidays” (American Thinker, 3-26-2013); “Statement from Congresswoman Sewell in Support of President Obama’s Executive Action on Immigration” (11-20-2014); “Congresswoman Warns That Roy Moore Will Take ‘Us Back to the Days of Segregation’” (Daily Caller, 12-10-2017); Terri Sewell’s Positions on Key Issues” (OnTheIssues.org). “U.S. Opens Spigot After Farmers Claim Discrimination” (NY Times, 4-25-2013).